It’s more than the season of giving. When it comes to new business, it’s the season of receiving. It is not uncommon for service-based entrepreneurs to grow disenchanted with December, assuming no one wants to invest in services during the holidays. However, savvy business leaders insist you can develop new leads, new conversations and, most important, new customers during the season. Crankset Group founder Chuck Blakeman told Inc. it’s a mistake to think people are so focused on gift shopping and parties they have no time to conduct business. Blakeman said while holiday obligations fill the nights and weekends for potential customers, the days stand as remarkably quiet. “I used the holidays to push my business forward significantly while other businesses were focused on opening and throwing away fruitcakes,” Blakeman said. “In fact, between Christmas and New Year’s I had three to four high-quality appointments every day, and in most cases, I was the only business activity those people had on their calendar the whole day. With planning and preparation, you can turn the period between Thanksgiving and New Year’s Day into Happy Holidays. Here are five steps you can take unwrap success before Jan. 1. You’ve spent all year making connections and building your email list. Now enlist the holiday season to make those connections count. It’s a reflective time of the year and people want to be greeted by genuine sentiment. Reach out and touch someone. Thank them for being a valued supporter, express hope that you’ll strengthen the relationship in the new year. Then, consider one of those added bells to turn the friendly email into a business generator. Utilize the Subject Field with a special holiday greeting. Extend an email invitation to meet for coffee or hot chocolate. As Blakeman said, they’re not as busy as they think. Craft a series of promotional emails with a special discount to boost business. Count down to the special day and tie inspirational messages to the promotions. Marry the holiday spirit with special offers. Offer solutions like, “How to handle the holiday rush?” or “Great gifts for great prices.” Even if they aren’t related to your business, people will remember you helped them ease the strain of the holiday season when it comes time to do business. Aim your messages towards connecting in the new year. Be specific in setting a date in time, if possible. Another approach can opt for building brand over building business. Some companies use the holiday season to generate donations for a specific cause or nonprofit. You can promise a certain percentage of your service fee to an organization looking to service the needy. Sure, people already have a lot of holiday parties on their list, but if you wrap your event in the right theme, it can be a fun time for customers and prospects and a business generator. Certainly, it requires a deft touch, and you need to get a return on your investment instead of just feting people for the fun of it. Partner with a related company to minimize costs. Consider teaming with other coworkpartners who are not competitors but compliment what you offer. Keep the length short. Sure, partying from “7 p.m. until the cows come home,” worked in college, but a more measured approach is required here. A simple happy hour or reception from 5-7 p.m. will do the trick. Create a good mix. An accountant shouldn’t invite only accountants. Look to bring together people from different businesses who might benefit from connecting. If possible, including a media member or two who might be receptive to a pitch (see below). Give away raffle prizes that include discounts on your services. Of course, mix in a prize to draw folks in, but also include lures for your business. Keep in mind it doesn’t have to be a grand give-away. People are as enamored with the since of winning something as the actual value. Be thoughtful. A hand-written message will carry more weight than a scribbled signature. Personalize it with words that reflect appreciation, even if it’s a potential customer and not a regular customer. If it’s a customer you lost contact with, use the holiday card to re-establish the relationship. Create a better photo bomb. A picture related to your business or services, themed for the holidays, will be more effective than a cliched Hallmark artwork. Remember, people are receiving a lot of greeting cards. Distinguish your piece. Have fun. Maybe feature you and your pet or you and your family. Even consider being goofy. Include a small gift card. A slight discount can, again, distinguish your card from others, and they serve as a reminder to think of you in the coming year. Tie your greeting card to a nonprofit effort. Like the aforementioned ideaabout a promotion tied to a nonprofit, it also can work with a card. ValPak, a St. Petersburg-based direct mail and digital marketing company, once sent out holiday greeting cards made out of a special biodegradable paper and embedded seeds that you could plant in your backyard and nurture. The fact a company that deals often in paper products delivered a card that reflected a care for the environment did wonders for its brand, even if few actually planted the card. The holidays possess the reputation for being a slow time for business, but it’s dreadfully slow for media outlets. Staffers at newspaper and television stations often take vacation during the holidays, and those who work through December long to find a story that hasn’t been done before. The opportunity to win over a reporter or editor may be the highest during the holidays, but you need to have the right pitch. Be unique. Every reporter out there has grown weary of doing the story about the Christmas tree tent and the mall Santa Claus. If your greeting card features a unique photo, if your holiday event benefits a nonprofit, if your holiday-themed promotion stands out, it’s a potential opportunity to be the subject of a story. Media outlets are undermanned all year and even more so in December. If your promotion or business idea represents a trend, include other businesses engaging with similar practices in your media release. It saves the reporter a step and backs your assertion that this really is a trend. Include empirical data. If your unique holiday offering addresses a rising issue or taps into a burgeoning trend, reflect that with a little research. It may be as simple as surveying your customers and presenting the reporter with a percentage: 68 percent of the respondents surveyed believe the holidays is a good time to generate new business. Make your pitch personal. In the release, which should be emailed, include a couple of asides that indicate you’re a regular reader or viewer of the media outlet’s content. Go beyond the standard compliment and offer details from a specific story or report the person you’re pitching recently produced. At Rising Tide Innovation Center, we can help you parlay the holidays into a happy season of business success. And in case you’re wondering, our ugly sweater party is Dec. 7. 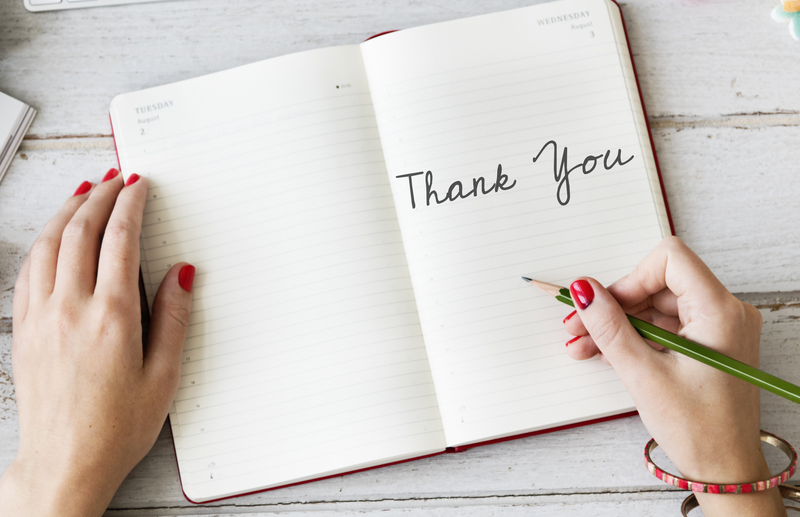 Can ‘Thank You’ Notes Change Your Business and Your Life?